Biotin, Vitamin B6, Coenzyme R and Vitamin H are all the same thing. If you’re not sure why biotin is important, the word ‘coenzyme’ should be your cue. A coenzyme aids digestive enzymes to break down foods. So without B6, lipids, carbs and proteins cannot be metabolized to fuel your body and give it the important nutrients it needs. Digestion and metabolism suffer but so does brain health, nervous system functioning, bone and nail health, hair growth and skin regeneration. In fact, biotin is often called the youth supplement as it is what gives you that aging gracefully appearance overall. The tag vitamin H stuck because in German it was dubbed Vitamin H for ‘haar’ which is German for hair. One of the benefits that are most visible when taking vitamin B6 is the improvement in hair and nail health. 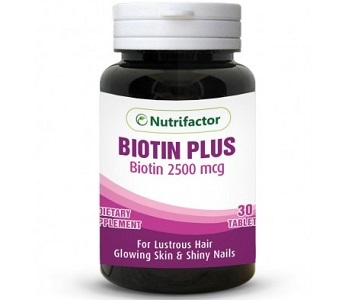 Nutrifactor, therefore, says it’s biotin product will give you thicker hair, healthy skin and stronger nails. The dose is almost 1000% more than the daily recommended average. But, if you have baldness, a flaky scalp, split ends, dull hair or nails that are brittle, for example, you will need big amounts. This formula gives you something extra that most don’t – folic acid. The latter is critical to normal cell growth. It isn’t clear what the daily dose is as per manufacturer guideline but the daily average is usually 1 to 2 tablets per day, or as otherwise directed by your doctor. Supplementation safety during pregnancy has not been confirmed so if you are pregnant or nursing, consult a doctor first. On the product website, a bottle of 30 tablets retails for $7.16. This is less expensive than most manufacturers however you are only getting 30 tablets, not 60 or 90 or 100 as you do elsewhere. When we bought 3 bottles the shipping was free but there was no discount. The company does not seem to have a return or guarantee policy; at least none that we could find. The manufacturer is a nutraceutical company in Pakistan. We couldn’t find reviews locally or on a site such as Amazon. The addition of folic acid in this formula is a great addition as it is also essential to cell growth. The majority of formulas contain biotin and no other active ingredient. It should intensify the results especially if you are taking vitamin B6 for thicker, more lustrous hair and stronger nails. Overall, you should see a more youthful appearance over time.